Hepatica or liverleaf, in spite of its popular names, is not only a beautiful spring wildflower, but has been used for centuries to treat a variety of health conditions. Although science has yet to uncover the exact mechanisms behind its medicinal actions, hepatica's therapeutic value has been widely validated by its traditional uses. Hepatica - also known as liverleaf, liverwort, round-lobed liverleaf, and round-lobe hepatica, among other names - is a native North American species found in woodlands throughout the eastern United States and parts of southeastern Canada. Famously implemented to treat liver diseases back in the 1800s, nowadays hepatica is used sparingly for a variety of medicinal purposes. As both its common name and its moniker "liverleaf" suggests, hepatica has customarily been used to live issues, as well as coughs, lung ailments, indigestion, constipation, and hemorrhoids. However, little scientific research has been undertaken to prove these traditional uses. Treating liver ailments. Liverleaf is used to ameliorate liver problems such as jaundice, hepatitis, and cirrhosis. Remedying respiratory problems. Hepatica is believed to help suppress coughs and alleviate certain lung ailments. Additionally, the antispasmodic properties of liverleaf are commonly used to treat gastrointestinal issues, such as stomach cramps and digestive tract discomfort. It is thought that most of the health benefits of hepatica come from its high content in mucilage, tannins, and flavonoids. Mucilage in hepatica forms a protective layer over the inflamed mucous membranes of the throat and mouth, counteracting the urge to cough, while flavonoids show antispasmodic and antioxidant activity, preventing damage caused by free radicals. On the other hand, tannins are water-soluble polyphenols present in many plants and have been shown to be protect the body from oxidative damage. These antioxidant compounds have also shown antimicrobial properties, as they effectively inhibit the growth of many fungi, yeasts, bacteria, and viruses. Tannins have also been reported to encourage wound healing by accelerating blood clotting, reducing blood pressure, and protecting the liver. Additionally, herbs like hepatica have a diuretic action that helps promote healthy kidney function by expelling toxins through the urine. AS A DIURETIC, HEPATICA HELPS PROMOTE INCREASED URINE OUTPUT, WHICH CAN REDUCE SWELLING. Hepatoprotective properties can be found in herbs like boldo and milk thistle, whereas eucalyptus and linden also aid with respiratory illnesses. Like other species in the buttercup family, hepatica contains the toxic substance protoanemonin. Taking high doses of hepatica may irritate the kidneys and urinary tract. The herb also has a slightly burning taste and can cause mucosal irritation, vomiting, diarrhea, and stomachache. When used topically, the herb may cause irritation, blisters, and itching. There is not enough information about the hazards and side effects of hepatica in therapeutic dosages. That being said, excessive consumption of liverleaf in any form may cause irritation in the kidneys and urinary tract. Women who are pregnant or breastfeeding should avoid consuming hepatica or consult a trained herbalist before using this herb medicinally. Hepatica is not used in a culinary capacity for cooking, nor are there any known edible uses of the herb; therefore, the most effective way of obtaining its health benefits is in its remedial forms. Infusion. Hepatica infusion is made from the leaves, and it is used to treat fevers, liver ailments, and constipation. Externally, it is applied as a wash for swollen breasts. Liquid extract. A liquid extract of hepatica blended with other herbs is thought to aid and cleanse the liver. Tincture. A concentrated solution - made from dried leaves macerated in alcohol and diluted in a glass of water - traditionally aids liver, gallbladder, and kidney function. Ointment. A liverleaf ointment or salve made from fresh, juiced leaves is believed to accelerate wound healing due to its astringent, antibacterial properties. Capsules. Liverleaf capsules are available as an antioxidant liver support for humans and pets alike, such as small dogs and cats. It is often mixed with other herbs, such as milk thistle. Although hepatica is easy to find growing naturally in the wild, plants can be bought from local nurseries, which offer different varieties of the herb, mostly for ornamental purposes. A wide variety of liverleaf products - from bulk, dried leaves to capsules and tinctures - are available year round in most specialty health food stores and through online retailers. Depending on the variety, hepatica plants are frequently spotted on slopes in woodlands, and are planted extensively in rock and woodland gardens. Liverleaf grows best in neutral to alkaline, evenly moist, humus-rich soil in partial shade. Before being sown, seeds should be stratified for three weeks at 32 - 41°F (0 - 5°C). Germination takes between 1 - 12 months at 50°F (10°C). After that period, seedlings should be moved into individual pots and grown in a greenhouse through their first winter. Hepaticas resent root disturbance and should be planted in their permanent positions as soon as possible. The best time for transplantation is late spring or early summer, after the last frost. This herb usually flowers in early spring. It is harvested when in bloom and air-dried in the shade. The roots must be left in the ground to regrow. In the spring, watch for snails and slugs as nuisances to young plants' leaves. Hepaticas are perennials and among the earliest of spring flowers to blossom. Plants grow four to six inches (10 - 15 cm) tall with light green, hairy leaves that arise from slender petioles from a common point at ground level. Hepatica leaves grow up to three inches (8 cm) long and wide and are lobed in three, similarly-sized parts. As the leaves age, they take on a deep burgundy color. White, pink, or bluish-purple flowers at the top of each stalk grow up to one inch (2.5 cm) wide with 5 - 12 petal-like sepals and numerous white stamens surrounding a green center. Hepatica's botanical names are Hepatica americana or Anemone hepatica. It is part of the Buttercup family, or Ranunculaceae. The botanical name of the herb, Hepatica, is believed to have originated from the Greek word hepar, meaning "liver," as well as the Latin word epatikos, meaning "affecting the liver." Anemone is also of Greek origin and refers to the wind. Two of hepatica's other common names, liverleaf and liverwort, come from the supposed resemblance of the leaves to the human liver, both of which have three lobes. Round-lobed hepatica (Hepatica americana) is one of the most common species throughout the United States. However, some botanists now lump this species with the sharp-lobed hepatica (Hepatica acutiloba) as separate varieties of a single species: H. nobilis. Round-lobed hepatica is designated H. nobilis var. obtusa, and sharp-lobed is called H. nobilis var. acuta. Other botanists include the plants in the genus Anemone, making them round-lobed hepatica: A. americana and sharp-lobed hepatica: A. acutiloba. While hepatica has a long history of medicinal applications, it wasn't until the late 1800s that hundreds of tons of leaves were gathered to be used in medicines. Demand became so great that additional quantities of dried leaves had to be imported from Germany. An estimated of 425,000 - 450,000 pounds (19,300 - 205,000 kg) were collected or imported to the United States in 1883 alone. Hepatica was a primary ingredient in "medicines" such as Dr. Roder's Liverwort and Tar Syrup. Eventually, the demand dwindled, and today, the plant is only of minor use in a few herbal preparations. 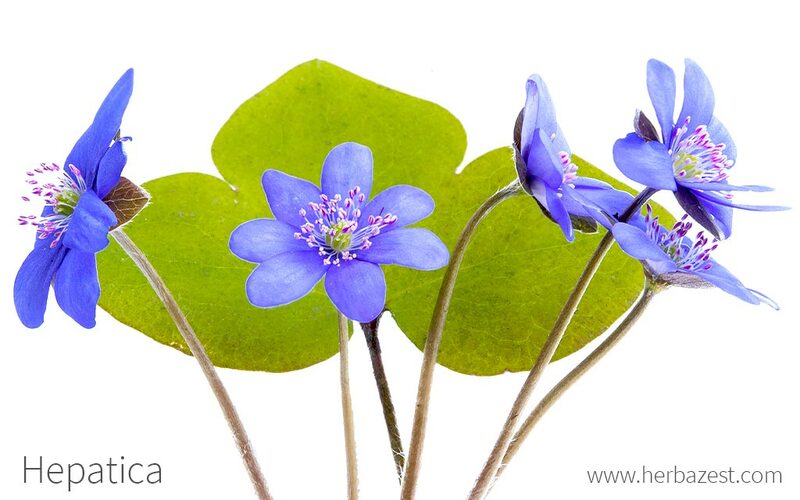 Hepatica has been portrayed on the postage stamps of several countries, including the United States and Canada. Hepatica is a spring wildflower that grows across much of the eastern United States and parts of Canada, mostly in natural environments, and there are no concrete numbers about its economic value. Hepatica is mainly used by the medicinal industry, and marginally in herbal remedies, such as extracts or teas. During the Middle Ages, there was a widespread belief that if a plant resembled a human body organ, it could be useful in treating disorders of that organ. This belief is known as the "doctrine of signatures" and was proposed by Paracelsus (1493 - 1541). Therefore, since hepatica leaves somewhat resemble the shape and color of the human liver, it was traditionally used for liver ailments. Hepatica is rarely used outside of medicinal boundaries. However, due to its esthetic appeal, the herb is planted ornamentally. Hepatica has been acclaimed for centuries for its utility in healing liver ailments. More recently, this herb has been brought to the attention of many for aiding with gastrointestinal and respiratory problems. No matter the instance, use hepatica with caution.